Sorry about my temporary loss of sanity with that last post. Did I seriously write a Haiku about not being allowed to wear my iPod?! I need professional help. Today’s post is all about goals. And in particular…. No, I didn’t just smash my hand down on my keyboard to come up with a jumble of letters (although sometimes I feel like doing that when I just can’t find the right words). Those 5 letters really mean something! I’ve mentioned BHAGs before on my My Story page, but never really got into what the heck they are in too much detail. 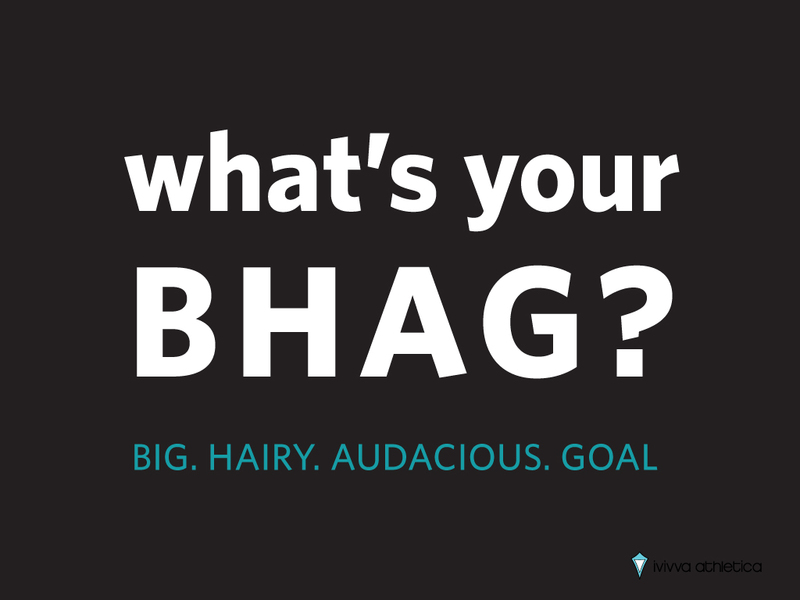 BHAG stands for Big Hairy Audacious Goals. These aren’t goals like planning to read 2 books this month, or vowing to cut it out with the chocolate after every meal dinner. These are goals that scare the crap out of you, make your stomach feel a bit queasy, get your heart beating faster and get other people to raise their eyebrows. I like to think of BHAGs as a “transformational” goal. Rather then simply being the goal to “do something”, I kind of see BHAGs as the goal to “become something”. The Half Ironman is definitely a BHAG for me. The goal, yes, is to finish the race (preferably in one piece). But more then that, the goal is to become someone who finishes what they start. I figure this one will be a good “kick in the pants” to get my running going, and get me training more consistently as we head into the winter months. Plus it will be right in the middle of holiday season, and I’m sure I’ll have some nanaimo bars to run off. Here comes the big one. The one that makes my stomach queasy and gets my heart beating faster. 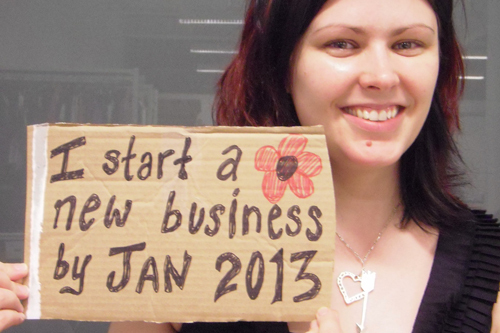 My second BHAG for 2013. Funny story about this race. I was re-reading some of my old journals from 2011, and came to a full stop at one of the pages where I was writing about my new years resolutions for 2012. One of my goals for this past year was to complete the Around the Bay 30K race. It’s funny, and a little sad, how quickly we forget and just move on isn’t it? I didn’t even remember that I had ever considered this race before. But I did. I considered it seriously enough to write it down actually. And then life carried on and it just fell off the back of the barreling train that is my life; disappeared into wherever it is that forgotten dreams and dismissed goals go to. This year, I’m coming back for it. I’ve never run one step further then 21.1km in my entire life. Some people do training runs that are longer then the actual distance of the race they’re training for, but I’ve never done that. I’ve only ever run half marathons, and 21.1km was always (more then) enough for me. 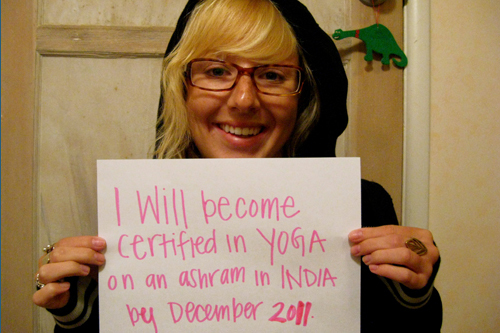 It’s kind of elating (you know, in a terrifying way) to think about breaking that barrier. Is there something beyond 21.1? What happens after that last 100 metres? Do you turn into a pumpkin? Stop breathing? Do your legs just fall off? I guess there’s only one way to find out! My very first triathlon! This was the first one of the season and it happens to be very close to where I live, so it was a no-brainer. This isn’t an actual “race”, but it is a training weekend that I stumbled across in looking online for triathlons and race events for next year. It’s run by a guy and his team of triathlon coaches, and it’s basically a weekend of training out on the actual race course. I thought this would be a really important thing for me to do, and was planning on going out to Muskoka to do some biking on these wretched hills anyways, but doing it with a group should be a lot more fun! It feels a bit funny and very surreal to say that I plan to do the Kingston Triathlon next year. For two years now I’ve gone to this race and watched Matt’s brothers Neil and Scott race. Getting the opportunity to share in their successes in this race was a big part of my inspiration to want to do a triathlon in the first place. It seems only fitting to finish off my year of training with this one. God I hope I don’t die. That harbour is ferocious. So there you have it! Looking at the races I’ve laid out, I know that I’m on the right track, because I feel excited looking at them all. It will be a lot of hard work, but at this time next year, look at what I’ll have to show for it all. It gives me goosebumps to think about, and that’s how I know that I’ve chosen a BHAG that is important to me. You Can’t Stop The Beat….or Can You? ?